An edge of your seat action thriller.A breathless chase to acquire a forgotten artefact.A game designed to take hostage an entire country.An experiment of total chaos by a mysterious psychopath. 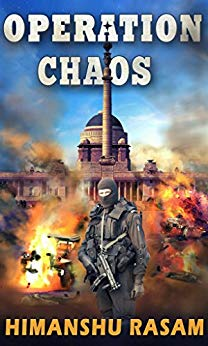 The Rashtrapati Bhawan, New Delhi, India: An anonymous phone call traced by the Indian Intelligence sets up a chain of disasters and the President suddenly gets pulled into a vicious whirlwind of murders and explosions. Within a few minutes of the President declaring a National level high alert, a mysterious tape is discovered in the Durbaar Hall of the Rashtrapati Bhawan. The tape reveals a threat- a strange demand from a nameless psychopath.When the nation's elite task force- 'The Black Cats', finds out that a major terrorist operation is about to commence, the loose links begin to connect. But then hell breaks loose when suddenly the country's prototype Hypersonic cruise missile 'BrahMos-X' goes missing from the DRDO's top secret facility. It is the work of the same unidentified maniac. The fate of an entire country now rests on the fingers of that madman.The Black Cats commander David D'costa along with his team and the Intelligence Bureau works on finding the mastermind and to unravel the mystery behind the unusual demands made by him. The search turns into a breathless chase from the monumental halls of the Rashtrapati Bhawan to the hidden locations in the heart of the nation’s capital, through the remains of Nalanda to the dark caves of Ajanta. Exploring the trail left by the Buddhist monks hundreds of years ago, breaking the codes and unlocking the keys, they find the unrevealed secrets of the inner guilds of the monks..... Where does the trail lead them?EXPERIENCE THE THRILL ! !